Before I get into the interview, a few words about the Mini Innofader from my own perspective. Elliot has worked wonders with things like the Innobender to make the long body of the regular Innofader fit where it shouldn't. But the need for a more robust short bodied fader has always been there. The Mini Innofader is a heavily Marx modified off the shelf short bodied fader from A-Plus. It's robust and clearly has the hand of Elliot all over the product. There's a very complex circuit board underneath and the feel has been adjusted to be as Innofader-like as possible. It's incredibly smooth running to the point where I'd say that you'd be hard pressed to tell that it was a short bodied fader at all, other than my the weight in your fingers. In terms of differences from the original Innofader - well it's a standard 4mm stem, has no tension adjust or onboard curve/lag adjust. But this is aimed at controllers rather than turntablist oriented mixers. And I suspect that if you want that level of customisation, then you're most likely not a controller customer. And once it becomes a retail item, Elliot will have cooked up some Innojuster based doohickey to offer curve control. Comparing it to all the controllers I have laying around in the lab, it's far and away the best feel. As and when this appears in a controller (assuming the manufacturer shouts about it being Innofader based rather than renaming it as ), you can be sure of having a premium experience and not having to attempt to cram a full sized Innofader into ever dwindling spaces. I've yet to transplant it into a controller, but expect a full report when I have. It won't really be a full review as you can't buy it for the moment - just observations. 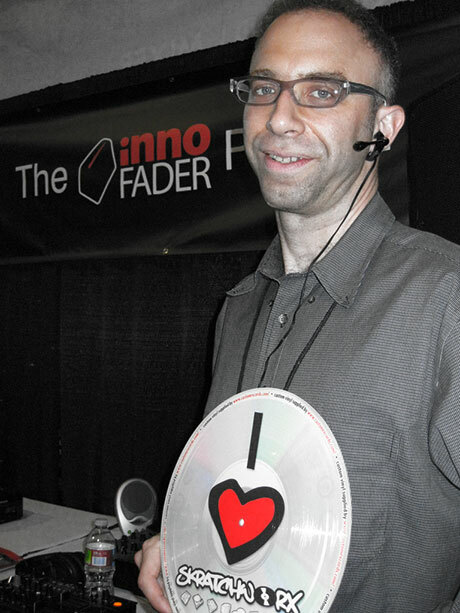 Hello I am Elliot Marx, owner and founder of Audio Innovate. We started out by doing the AEM-100/AEM-100i mixers which are known for their unique analog effects. We are also known for the Innofader crossfader designed to be a replacement in a huge variety of mixers and controllers. Justin Woo aka "Punky" on the forums helps out with sales and Mark Naegel aka "Bitflip" helps out with product servicing. While I started out in DJing, most of my time nowadays is dedicated to developing DJ products for Audio Innovate and as a consultant for American Audio. I also enjoy biking and surfing. How did you get into the DJ industry? What's your track record? I got into the DJ Industry back in 1995 by developing a product called the Beatkeeper under the brand name Advanced Audio Concepts. Numark discovered us and I helped them with incorporating the Beatkeeper into their entire product line and developed Numark products until 2004. Over the past 15 years I have developed the entire Numark CD player product line as well as some mixers. I've done the firmware and hardware development for the CDN-32, CDN-34, CDN-88, CDN-90, Axis 8, Axis 9, CDX, CDN-35, 1235, 1635, 1820, 1835, 1885, and 5000Fx. Most of these products have been very successful, selling over 1000 pieces per month. Since 2004 besides Audio Innovate I have done the software and hardware development for the VMS2 and VMS4 from American Audio. The VMS4 has also been very successful but as nowadays ideas get copied quicker so there's a bit more competition to fend off. How did the Innofader come about? Originally I spec'd the Pro X Fade for the AEM-100/AEM-100i mixers, and to my surprise the #1 reliability issue was the crossfader itself. 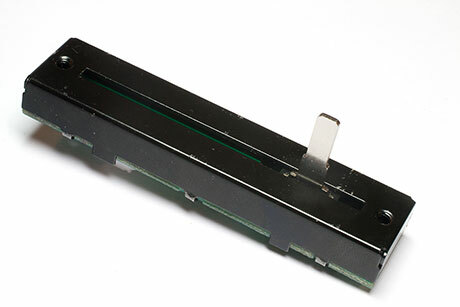 Most customers weren't disciplined enough to keep up with weekly fader cleaning, so they had issues such as faders getting sticky and bleeding. Others got creative and kept adding dead space every time the fader started bleeding. Something about the market didn't seem right. There were a few other options floating around like the Vestax PCV fader, Pro X Fade, and Infinium fader, but it seemed most of the time DJs would just get a better mixer for the faders or replace worn out crossfaders with the same breakable faders. There had to be a better way. I became determined to come up with a super reliable, great feeling, and low maintenance replacement part that DJs could use in any mixer. I also have a bit of a conservationist mentality; it seems a shame that a DJ would have to throw away a perfectly good mixer just because the fader went bad. What has been the biggest challenge with the Innofader? The biggest challenge has been keeping up with the various mechanical and electronic standards manufacturers have thrown at us, while at the same time trying to simplify the installation process and limit the number of items we sell to a manageable number. In the beginning we kept adding adapters but now we're focusing on a few basic models. Did you think it would turn into the complex project that it has? Frankly in the beginning I had no idea how complex this would be. In the beginning I was bouncing ideas around with Professor Bx, and we went under the notion that most DJs who liked to scratch were using higher quality mixers, and these mixers used 3 or 4 wire crossfaders hooked up to VCA circuits with simple 3V-10V power and ground hookups. But the more we looked into it the more we realized that everyone was coming up with other standards. Some have wiring or wiring out of order. Rane has their own unique calibration. Ecler has it's own "Eternal Compatible" standard. Some mixers like the A&H Xone:02 reverse the crossfader power when the crossfader is reversed. This is not to mention that once the Innofader came out, all of a sudden DJs were looking to turbo charge mixers that cost less than the Innofader itself. Given your "I'll make it fit anything" approach, is there something you've really wanted to do with the Innofader but been beaten by? Besides mixers which just can't fit the Innofader mechanically, one mixer which I've been stuck on is the Vestax PMC-05 ProIV. I had our tech Mark Naegel look at the circuit and it's got this crazy multiple magnetic sensor. I know I could figure it out but frankly I'm very annoyed by this whole thing. Vestax for a long time had the industry standard PMC scratch mixers. Now with the 05 ProIV all of a sudden DJs have a new standard incompatible with all the others, even incompatible with Vestax's own PCV fader. 1) For VCA mixers, either a 3 wire connection of 4 wire connection is all that is needed. 3 wire connection: power, VCA, and ground. 4 wire connection: power, VCA1, VCA2, and ground in that order. For virtually any product it is possible to use one of these configurations. Anything different is just a manufacturers' attempt to prevent DJs from using other parts. Why haven't manufacturers made life easier for everyone by adopting standards for fader fitting? Every manufacturer has a dream of becoming the dominant brand in the DJ industry. So as I illustrated above, what many will do is come out with what they think is the ultimate fader and as a result have absolutely no accomodation for fitting anything else. This goes for any DJ product, not just replacement crossfaders. If you buy X brand mixer manufacturers want you to buy X brand replacement parts, X brand software, X brand turntables, etc.. Most DJs just buy whatever brand is the best for whatever function it serves, but many manufacturers are more focused on trying to kill off and exclude competition rather than make lives easier for customers. The good news though is that manufacturers little by little are supporting the Innofader and realizing that such support reflects very positively on their products. 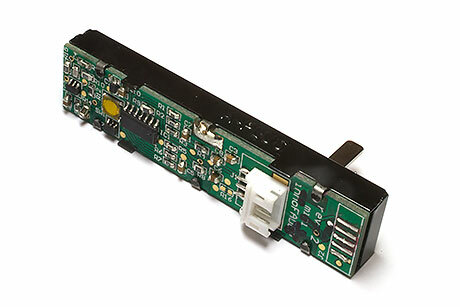 American Audio have ensured their VMS and many other products are Innofader compatible. Allen and Heath have worked with me to test Innofader models throughout their product line. Denon tests Innofaders on all of their new products now and advertises them as Innofader compatible. There are many others we are talking with now who are taking steps to make sure their new products are Innofader compatible. 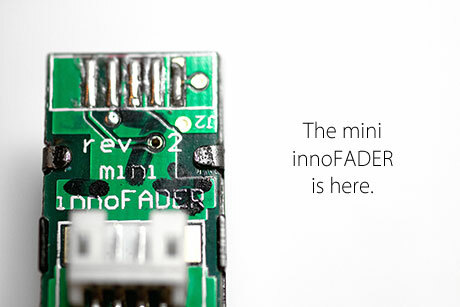 The next Innofader project is the Mini Innofader. What's this all about? The idea originally started out as a way we could address products which can't fit the Innofader. The Innobender has addressed many such products, but there are still others for which the only solution is a mini Innofader. In addition, many maufacturers told us that the original long body Innofader is too expensive for them to include in manufacturing. So I've developed the first OEM mini Innofader model to have the least expensive circuitry but still have the great feel and reliability that the Innofader is known for. The Mini Innofader is going directly to manufacturers rather than the end user. Why? The OEM version mini Innofader is only going to manufacturers as a first step. If we set up to do retail first the cost would be too prohibitive and I couldn't get the mini Innofader project off the ground. The larger OEM quantity makes it possible to get this project off the ground. An additional detail is that there are far more logistics involved in creating a retail product vs. an OEM product, so if possible it's better to start out with the OEM product. Will it ever become a retail product? Yes we will make this happen. I will keep everyone posted with details once things start to mesh with this. A lot will be based on feedback we are getting from the OEM version mini Innofader. We are sending out samples to various people in the industry to get feedback. Audio Innovate has developed a strong reputation based around stellar support. How important is the personal touch to you? And is it hard to maintain for such a small company? Why thank you for your compliments. I always had the attitude that if a customer spends money on my work, I am obligated to give the customer a good working product. I'm a bit of a perfectionist in this sense and see the quality of what I do as a reflection of who I am as a person. We have customers who buy several Innofaders because we've given them this great support from day 1. Most Innofader customers find out about our product from other customers who like not just the product but the support behind it. It's very difficult to get a small company off the ground. The logistics of shipping and storing product are far more complex for a small company. Small volumes make warehousing very expensive relative to the product cost. Without worldwide warehousing the only other option is air shipping. For the Innofader this works fine, but with mixers costing $50 to $100 to ship, this makes such a process virtually impossible to maintain. In addition it's very hard to get manufacturing support, and many will require a lot of upfront investment to get started with you. If you have a larger company the tables are turned and suppliers will go out of their way to attract and keep your business. What is the future for the Innofader family? And for Audio Innovate? Any more non-fader products of your own? Right now between consulting I'm doing for American Audio and developing Innofader products I've got a lot on my plate for the next few years. It's going to be some time before we have the logistical setup to do complete products. praise the Lord and Elliot! That is the same fader in the 4dj, right? Just a different board? Surely I can't be the only one thinking "The Minnow-Fader"??? would it fit the pioneer 707/909 (linefaders)? Wow, Elliot, you're getting compared to Jesus/God. That's pretty serious stuff right there! No, that is not the same fader as in the SCS4DJ. @DJ Rockwell - we were actually calling it the "Minnofader" for a minute, while it was in development. I want to say that the line faders in the 707 / 909 are soldered onto the board, but don't quote me on that. Elliot could tell you better. Yeah the 707/909 fades are soldered directly to "a" board which is user removable, not attached to a huge PCB. Hey Punky did you guys ever get an Inno working in the Denon dnx100? "we were actually calling it the "Minnofader" for a minute, while it was in development"
Great! Just think of all the small fish related marketing. Man that looks small enough to fit inside a HandyTrax! That would be really good if that could work. Thanks guys for all of your support! We're still looking at how to make it work for the various products, all with their own ways of mounting. I'm sure once we get a few samples out there we will know better. 707/909 line faders are soldered to the board. If one of you can take pics & email to me support@audioinnovate.com that would be very awesome! Elliot Marx "The Gentleman" of the crossfader, respect! Yepp im confident that InnoFader would sell if they made a upgradekit for the Pioneer 707 / 909, wich you all know has overpriced and overall below standard quality linefaders. They work and sound well as new, but useing them for a while they start to leak and start getting other problems that mess up you flow! Innofader UG kit for Pioneer DJM 707 / 909 PLEASE! So will this just drop right into the djm 800?